New York City for decades was defined by it’s pubs and the food they served. Before there were “Top Chefs,” the Food Network & Foodies, there were pubs. 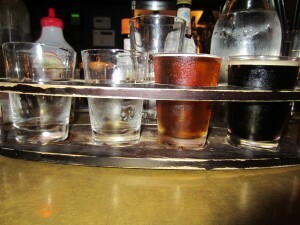 The concept was simple, knock off the days toils with a Drink, a Bite and a smile from a friendly bar keep. Many of the classic NYC Pubs, most of which are Irish still exist and still serve great Pub Food. Then there is Pour George. Paying homage to a yesteryear, this West Village gastropub combines the best of what was and what is in New York pubs. The bar has a classic feel with wooden floors, tables and chairs and a charming stone fireplace. They offer the finest of unique pub fare using locally sourced ingredients where possible like Deep Fried Pickles, Wild Boar Sausage on a Pretzel Roll, Mac N Cheese, Crispy Chicken Wings and the Pour George Burger, served on Sourdough with White Cheddar and Fried Onions. 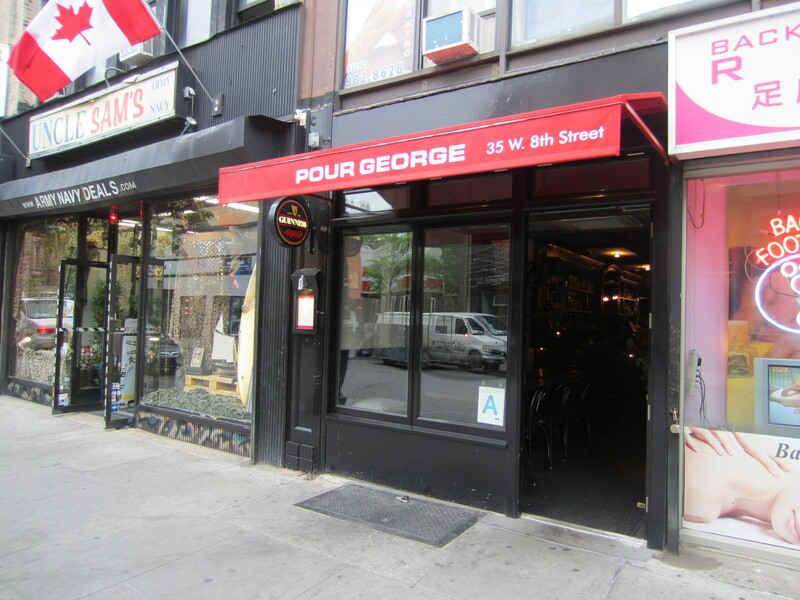 Saddle up to the bar or grab a seat a table and get lost in the 70+ list of Whiskeys that Pour George stocks on their sky high reaching shelves or opt for a draft from their rotating Craft Beer selection. Chances are you’ll want to make this cozy pub one of your regular haunts for good times, good Spirits and good Food. 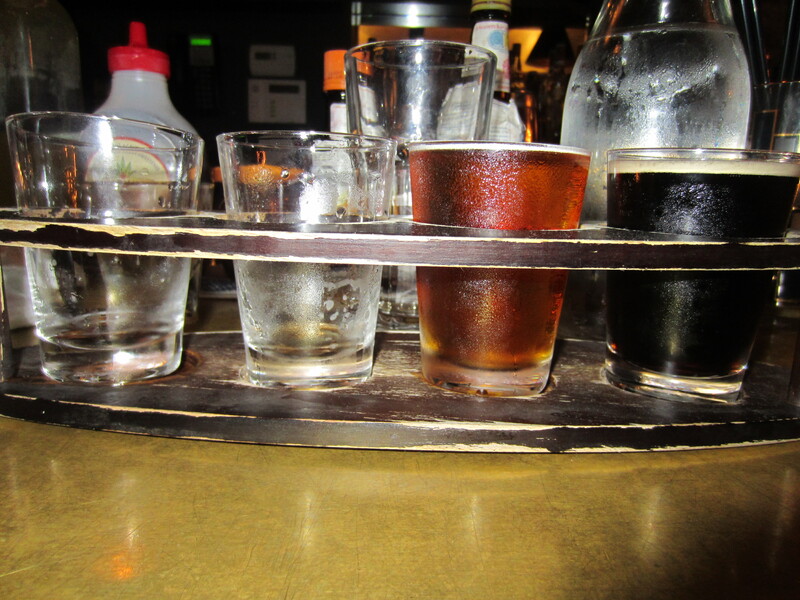 As NY Burger Week coincides with American Craft Beer Week, it’s only proper that the meal started off with a flight of cold Beers. I made some small talk with friendly bar tender Carla who was celebrating her birthday. You’re guaranteed a good laugh and some friendly chatter if she is behind the bar. Be warned though, Carla loves Pickle Backs. 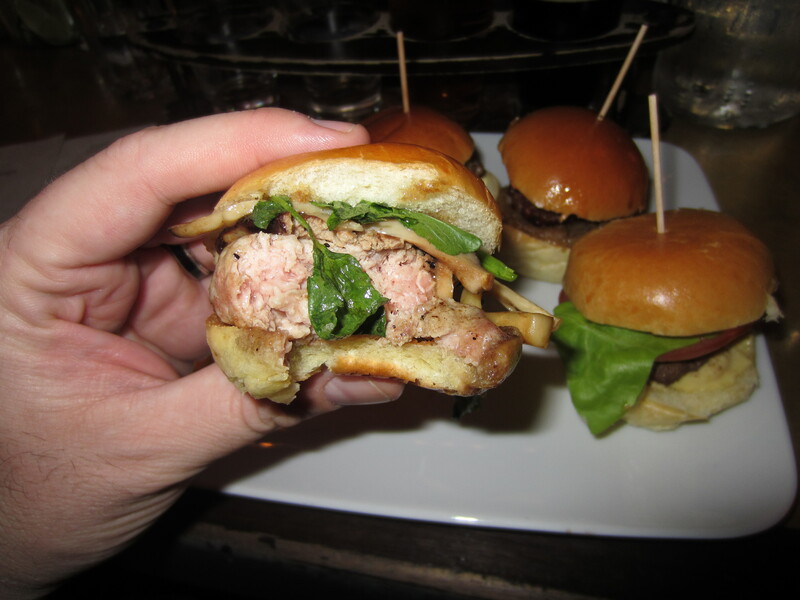 Diners who bought the Thrillist Reward were invited to taste test a selection of off-menu & Wild Game Burgers prepared by the restaurants Chef Will Rogue. All of the meats used at Pour George are from Pino’s Prime Meats (note to self; must try Pino’s housemade Hot Dogs) who Will claims “can get any meat you ask for.” From the 4 selections, each diner would choose a favorite and submit their vote. 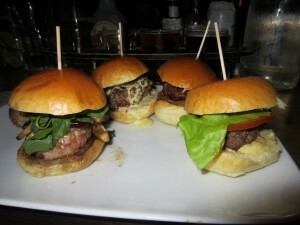 Which ever Burger received the most votes would be added to the menu for the season at Pour George. Missed the event? 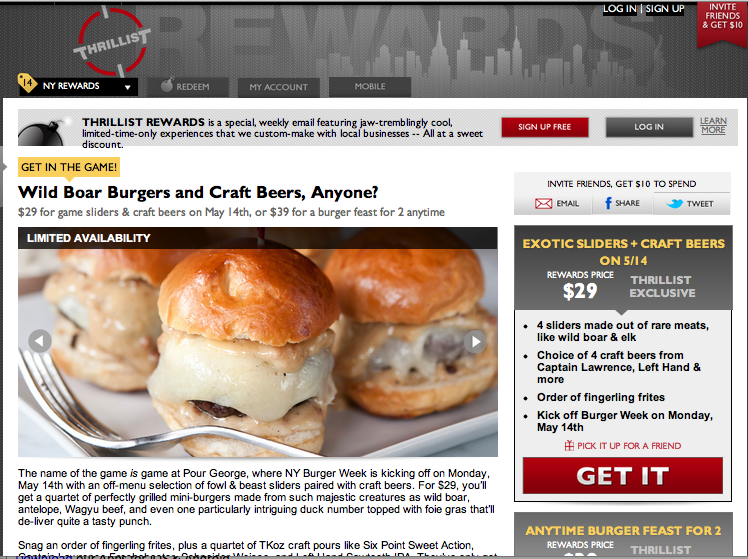 No worries, for a limited time, you can still buy a Burger Fest for 2 people for 2 on Thrillist Rewards. For $39 you’ll get a choice of 2 full sized Burgers, including the XXXXX, an order of Sliders, 2 side orders and 2 flights of draft Beer. – This Burger literally melted in my mouth. The incredibly tender Patty was light on the palette. I almost took this down in only 2 bites but reminded myself to go easy and enjoy all the little intricacies in the subtle flavors of the Meat. 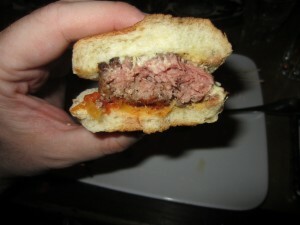 – This incredibly savory Burger had a great, all natural Beef taste. Of the selections offered, it was the closest one to a standard Beef Burger but with much more intensity than an old school NY Pub Burger. 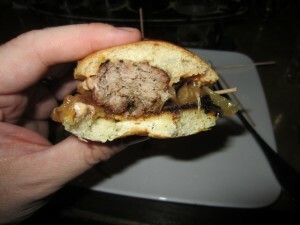 – Wild Boar, unlike it’s cousin, Pork, does not have a robust flavor so adding the Smoked Aioli & Onions really helped to define the overall profile of this Burger. 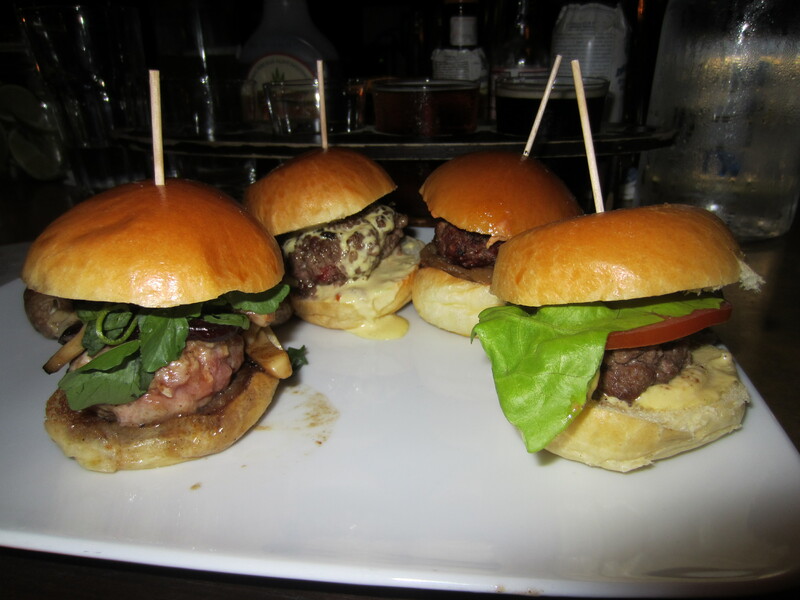 I loved the smokiness that the Aioli brought to the table but it did drown out the flavor of the Meat to an extent. 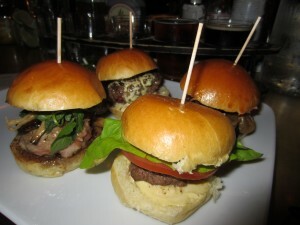 That’s what’s tough about mini-Burgers, it’s not easy to get the meat to toppings to bun ratio just right. Regardless, this was a good one. 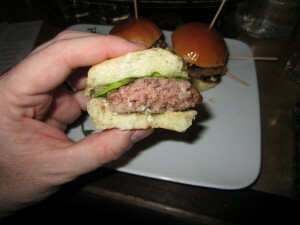 – This Burger definitely had the richest flavor of the four offered. 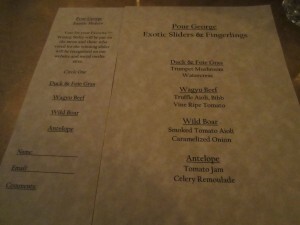 The Antelope was a little gamey, in all the right ways but also just a tad on the sweet side. The Celery Remoulade was an interesting use of sauce and not sure how necessary it was to the over all sandwich. I would want this again and again but then again, the Rev loves himself some Gamey Meats! As voted by the people, the Wild Boar, Smoked Tomato Aioli, Caramelized Onion Burger is now on the menu at Pour George and available for a very limited time only for purchase on Thrillist Rewards. Pour George scores a 6 on The Rev Meter. This entry was posted in Bar, Beer, Burgers, Event, Gourmet Burgers, Hamburgers, National Hamburger Month, New York, NY Burger Week, Thrillist Rewards and tagged best burger nyc, burger conquest, cheese, ciancio, craft beer, french fries, hamburger, new york, new york burger week, ny, NYBW, nyc, off-menu, pinos prime meats, pour george, rev, review, the rev meter for social community, thrillist, thrillist rewards, wild game. Bookmark the permalink.